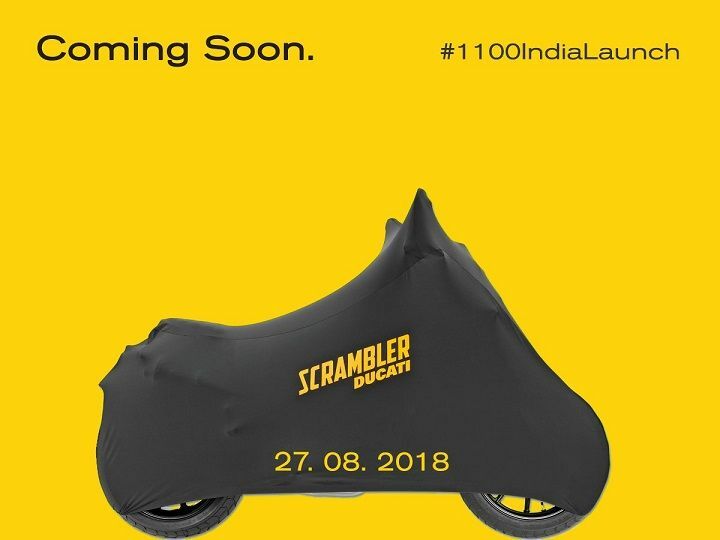 Just a few weeks after the Ducati Scrambler 1100 was spotted in the country, the Italian bike manufacturer has announced that it will be launching the motorcycle on August 27. The Scrambler 1100 made its global debut at last year’s EICMA show in Milan, Italy. Ducati offers the Scrambler 1100 in three variants - standard, Sport and Special in global markets. Expect the standard variant to enter the country first. Bookings for the motorcycle is open unofficially at select dealerships for a token amount of Rs 1-2 lakh. The motorcycle is likely to cost around Rs 11 lakh and will compete against the BMW R nineT Scrambler, which retails at Rs 15.55 lakh (ex-showroom). The design of this motorcycle is unmistakably Scrambler. It gets a round headlamp, petite fuel tank and a single-piece ribbed seat. The 15-litre steel tank comes with interchangeable aluminium panels too. Upright ergonomics and conveniently-placed footpegs are ideal for both city riding and stand-up riding off the road. The lighting system is all-LED and the offset-mounted instrument cluster is fully-digital as well. To differentiate it from the smaller Scrambler, Ducati chose to equip this motorcycle with twin underseat exhausts rather than a stubby conventional unit. It not only makes the bike look a lot cooler but will also be handy off the road. For suspension, both the standard and Special models get adjustable (rebound and preload) 45mm Marzocchi USD front forks and a Kayaba rear monoshock. The Sport variant, on the other hand, comes with upmarket Ohlins inverted front forks and Ohlins monoshock, both of which are adjustable. Dual 320mm front discs and a 245mm rear disc are standard across all three variants. The standard and the Sport variant ride on 10-spoke light alloy wheels while the Special model comes with spoked aluminium rims. All three variants are shod with Pirelli MT60 rubber (120mm front and 180mm rear). Stay tuned for launch updates.